AM EXCLUSIVE: Chip Foose Custom Designed Outcast Wheels! Tired of seeing the same old set of rims on every other Mustang that rolls past? Think you’ve run out of wheel options? Think again. 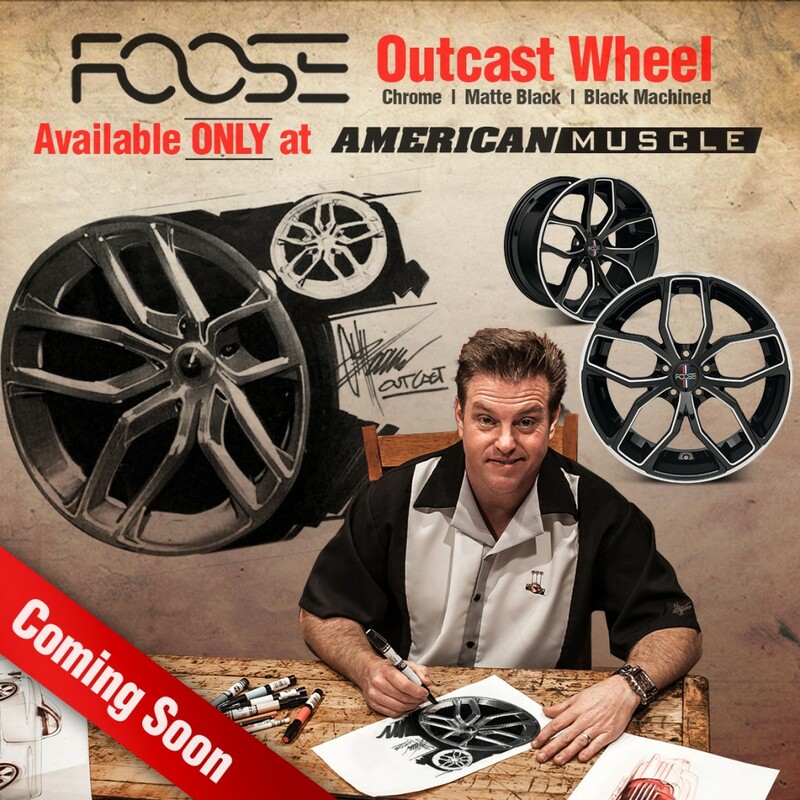 AmericanMuscle would proudly like to introduce to you the new Foose Outcast Wheel. Custom designed for AmericanMuscle by Chip Foose himself, this exclusive wheel is offered only through our site and, may I say, is just flat-out raw. Here’s your chance to be the first person in town with these unique new wheels. How To Upgrade Your Mustang’s Ignition for $50 Cheaper! Accel-erate Your 2011+ Mustang’s Horsepower with Coil-On-Plugs! We dropped a brand new Accel Super Coil on Plug Kit into our 2011 Automatic Mustang GT to see what kind of horsepower gains were left on the table. Rated at over 412 horsepower, you really wouldn’t think that there’s a ton of room for improvement by adding affordable bolt-on performance mods (besides the basic CAI/Tuner/Exhaust). Our friends over at Accel found a way to add as much as 10HP and 9TQ to a 2011 and newer Mustang GT or V6 in less than an hour! Your Mustang Need 577 Horsepower? It’s Right Here! How badass is THIS!? The 2011 5.0L Mustang GT that Vortech Superchargers brought out to SVTPerformance.com’s Dyno Day completely wowed the crowd on its insane dyno run at GTR Performance this past weekend. The 5.0L GT was rockin’ the new blower plus exhaust to equal out to an amazing 577 rear wheel horsepower at only 6 PSI on GTR’s Dynojet. Killin’ it! Check out the video and see for yourself. You, also, can have 600+ horses under your foot with one of these bad boys installed on your new 2011 Mustang GT. Don’t hesitate to contact AmericanMuscle to get yourself all setup with a new Vortech HO system that is known for the highest efficiency, reliability and performance out there in the market. You know you can’t resist the urge to make your friends jealous. You already did it with your new 5.0L. Now you can do it with your new SUPERCHARGED 5.0L! Go ahead, rub it in. Many of you have seen the original SCT Touch Screen Xtreme (TSX) that allows you to datalog wirelessly through your Mustang’s OBD-II data-port. Well, SCT is taking that technology one step further. Check out what they’re doing with an iPad! You’ll be able to connect and tune your vehicle wirelessly with any iPad, iPhone or iPod Touch!